I've installed visual studio 2019 preview. i tried to update Android SDK tool to 26.0 after an update failure i realized that android SDK manager and device manager are disabled. After like 2 hours, i realized tools folder missing in C:\Program Files (x86)\Android\android-sdk. To solve the problem i download a new tool folder from https://dl.google.com/android/repository/tools_r25.2.3-windows.zip then extract it to the android-sdk location. 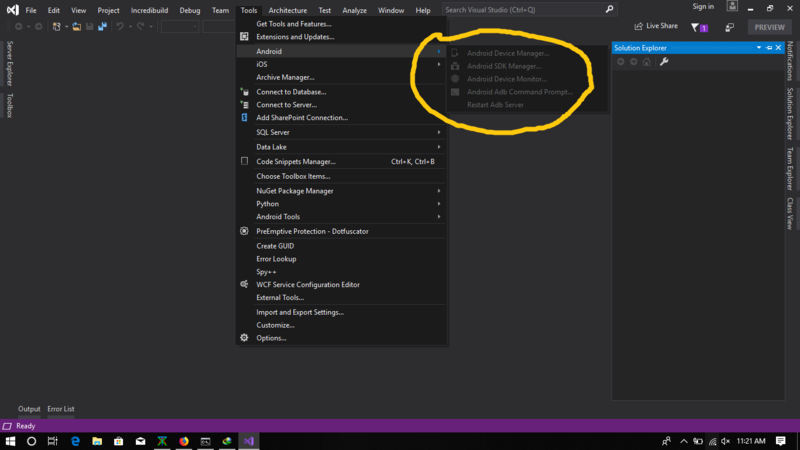 Restart visual studio and tried to open Android SDK Manager and it worked! !